I love art but I don’t feel I am artistic; I love to draw, but don’t feel I am adept; I love to design but don’t have any technical training. What to do about it? Thanks to the World wide web, we can learn a lot more about design techniques and apply them to our art. Every artistic piece contains some, or all, elements of design. These elements are then combined with a number of design ‘principles,’ in order to bring together an eye-pleasing, cohesive visual unit. Knowing these elements and how to use them, can make all the difference between being able to produce an eye pleasing piece of art, or a disjointed, unattractive one. Every visual piece is comprised of certain design elements or parts which may include Line, Direction, Shape, Size, Texture, Value and Colour – in that order. Design Principles, (which I will talk about later), are applied to the elements in order to bring them together into a cohesive unit. How the principles are applied, determines the overall effectiveness of a design. Firstly, let’s look at the element: ‘shape’ and its role in design. Mechanical Shapes or Geometric Shapes might be the shapes drawn i,n a design, using a ruler, compass or drawing template or tool. Mechanical shapes, whether simple or complex, produce a feeling of control or order. Organic Shapes are freehand drawn shapes that are complex and normally found in nature. Organic shapes produce a natural freer feel. Rangoli is a traditional and transient form of art drawn in chalk by Hindu women, in southern India, on the front steps and entrances of buildings as part of a daily devotional practice. The decorations use ‘shape’ in a variety of styles and motifs which vary according to different tribal groups and festivals. There is more information about Rangoli here. The Acanthus leaves is an organic shape used prolifically in Norwegian Rosemaling: particularly Gudbrandsdal style. Os Rosemaling frequently uses mechanical shapes such as circles and diamonds. I am currently running a Design Sketching Challenge in a Facebook group I admin, and I’d love to extend this invitation to you, to join a blogging version of this challenge here, on our blogs. The challenge is a great way to encourage those who would like to sketch, but don’t yet have the confidence or motivation, to try. Seeing others strive for, and share, their artistic journey can increase inspiration and awareness of one’s design skills. You never know what you are capable of, unless you try! You can opt in and out as you wish. See more about joining in below. It needs further adjustment and improvement, so I try another. 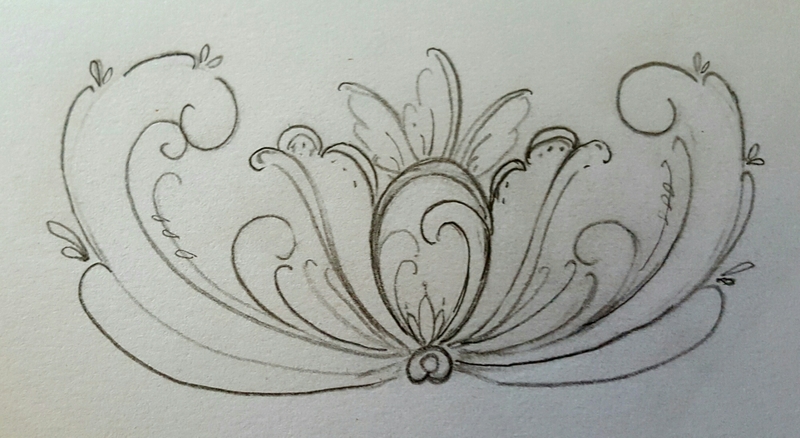 Still not satisfied, my final sketch for this first prompt, comprises circles, semi-circular arches, some natural elements in the leaf like scrolls and the heart-shaped flowers. I used a simple border to frame and hold together the design in one cohesive unit. Would you like to join me in the Design Challenge? Next week I will post links to those blogs that participated. Leave a comment here on this post, so others can find their way to your blog. Follow me to view each week’s prompt posted on a Sunday. * N.B. I am not a tertiary qualified Art teacher and don’t purport to be one. I have based this information on my own research and experience. I am happy to take on board further input and or any corrections, deemed necessary, by way of comments on this post. I like the idea of the Design Challenge, but drawing isn’t my thing. But I look forward to seeing what others produce. Oh go on Peggy. It is a 15 minute doodle. We all started somewhere. I’ll think about it. My second cousin, Grant Wood, painted the famous ‘American Gothic’. One of my daughters and two siblings have art skills. I missed out on those skills. Perhaps they are there, waiting to be awakened? What a great idea. I want to do this. I also live Rosmaling! That is fabulous Tracy. I am happy to have you on board again! Are you going to complete this on a blog or on facebook? Link me back to the post when you write it up. I would be very happy to see your sketches. Everyone’s doodles have to start somewhere. I have the advantage of studying these art forms in Norway and here from books. Any art form is acceptable for this blog challenge. It can even be a squiggly doodle!! I think I told you about my former daughter-in-law. She has bad eyes, but is a great artist, from my perspective. Very abstract. We went out to dinner one night and the tablecloth was paper, and the restaurant brought us all crayons. We each made our own doodle. It was so fun, and they all came out well. Art scares me to death, but a few weeks ago I took a pysanky class with friends. Did you see that post? http://wp.me/s7tP3I-pysanky It was so much fun. I will take a look. I don’t know anything about pysanky. I would love to try it. And you are honing your sketching skills as well. Truly, there is s knack to using the wax stylus. Thank you, Lydia! I hope you give it a try! Great idea, Amanda. Wish I was good enough to participate! Nonsense, Ann Christine. You are good enough. And Everyone has to start somewhere. I imagine you have already been doodling for years without realizing it? I think this is a great idea! Great post! Thank you. I have learnt a lot over the five weeks!